If you are traveling eastbound on I-20, Marshall, TX is the last of the "biggish" cities you're going to see before you hit Louisiana. I think of it as the third entry of the "I-20 Trinity" that includes Tyler and Lonview (sorry Kilgore). 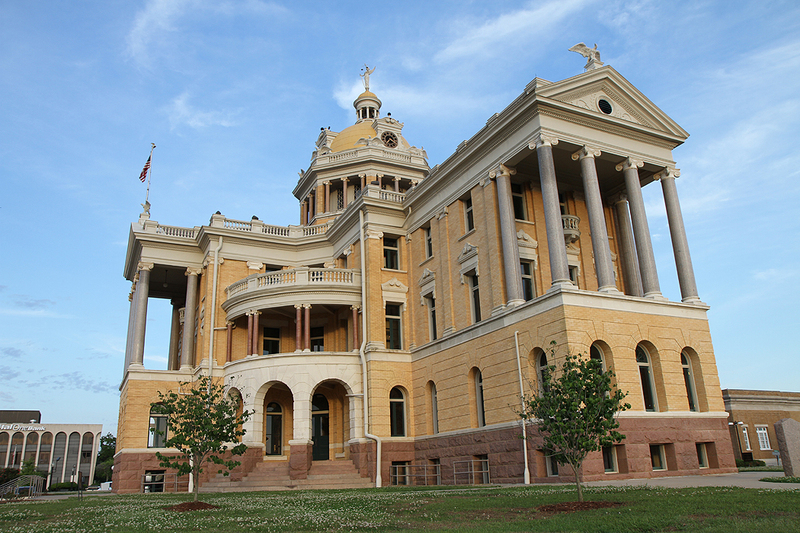 They've put a lot of work into their historic downtown area but their pride and joy is the Old Harrison County Courthouse. And with good reason. Even if you're not a "courthouse groupie" you can't help but give it a good long stare if and when you find yourself in downtown Marshall. It no longer holds court but serves as a museum and town centerpiece as well as being the building that pops up in most East Texas travel literature. 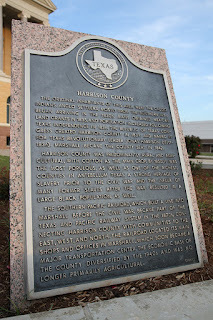 Two years after Harrison County was created by the Republic of Texas Congress in 1839, landowner Peter Whetstone offered property for a courthouse, a church, and a school in an effort to persuade county officials to locate the seat of government in the new town formed on his land. Isaac Van Zandt, the local representative to the Republic Congress, named the new community Marshall in honor of U. S. Chief Justice John Marshall. By 1850 it had become one of the wealthiest towns in East Texas, with a population of about 2,000 and a number of cultural, religious, and civic organizations. 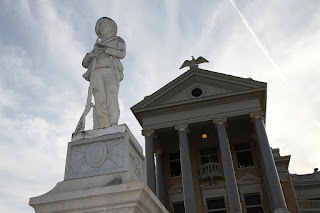 An important Confederate stronghold during the Civil War, Marshall was home to the wartime capital of Missouri and the postal headquarters of the South's Trans-Mississippi Department. Following the war, it was the site of an office of the Freedmen's Bureau. 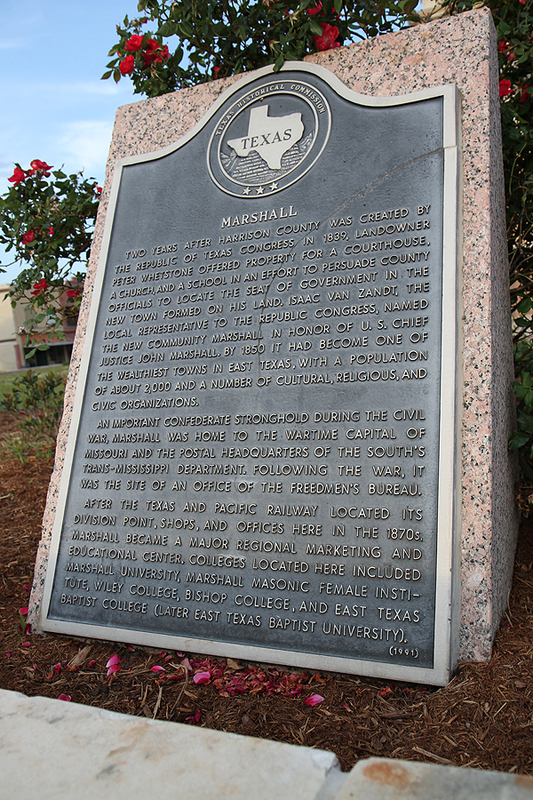 After the Texas and Pacific Railway located its division point, shops, and offices here in the 1870s, Marshall became a major regional marketing and educational center. Colleges located here included Marshall University, Marshall Masonic Female Institute, Wiley College, Bishop College, and East Texas Baptist College (later East Texas Baptist University). Harrison County was predominantly rural and agricultural, with cotton as the main crop. By 1850, it was the most populous, as well as one of the richest counties in antebellum Texas. A strong heritage of slavery prior to the Civil War and the influx of many former slaves after the war resulted in a large black population, as well. The Southern Pacific Railroad, which built a line into Marshall before the Civil War, became part of the Texas and Pacific Railway system in the 1870s, connecting Harrison County with communities to the east, west, and north. The railroad located its main shops and offices in Marshall, which soon became a major transportation center. The economic base of the county diversified by the 1940s and was no longer primarily agricultural. 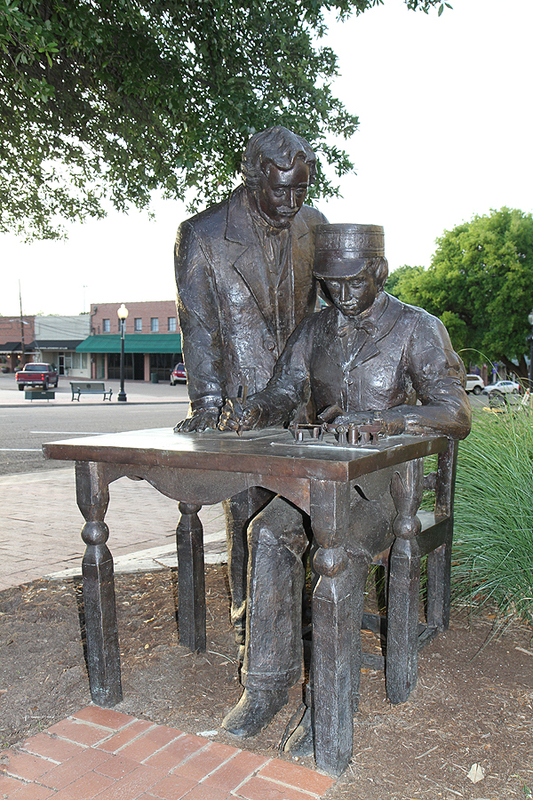 The park is the site of the first telegraph office in Texas and these two stand vigilant tapping out welcome greetings to visitors.